Valletta 2018’s annual Valletta Green Festival, now in its fifth edition was officially opened earlier today in Pjazza San Ġorġ, which is housing the festival’s iconic infiorata boasting the festa motif. 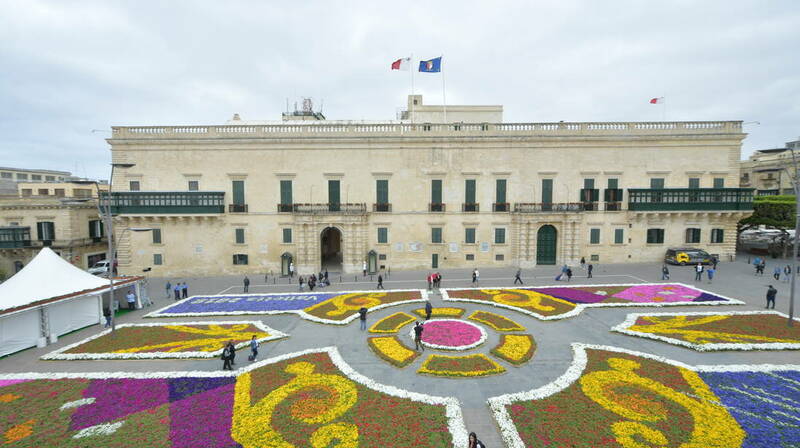 The infiorata, now a staple of the Valletta Green Festival, is the biggest one to date, constructed of 110,000 plants. A rooftop garden has also been opened in Pjazza San Ġorġ, on top of the roof of the Main Guard. Apart from the infiorata and rooftop garden, numerous workshops and educational activities will be taking place in the square, among which include workshops by Solar Cinema, a film project by Valletta 2018 which sees popup screenings taking place around the island using the power of solar energy. Valletta 2018 is also collaborating with Nextbike to promote green transport. People may rent Nextbike bikes for two hours free by downloading the Nextbike code, registering and inputting the free code: 863386. Exhibition tents by various NGOs including the China Cultural Centre in Malta, ELC, Garby & Tidy, Birdlife Malta, SharkLab Malta, Solar Cinema, Żibel, The Gaia Foundation and WasteServ. Flower carpet made of flower pots covering an area of more than 1000sqm. In Malta, buildings cover one third of the Island, leaving greenery in the dirt track. Green roofs are one way to bring plants back to urban areas with loads of benefits. A green roof will be exhibited on the roof of the Office of the Attorney General to raise awareness and educate the public about the importance of greenery, and how they can implement green initiatives within their homes. Educational talks discussing the ocean as a habitat, from the perspective of Birdlife Malta’s LIFE Arċipelagu Garnija project with SharkLab. The LIFE Arċipelagu Garnija project aims at securing the Maltese Islands for the Yelkouan Shearwater. SharkLab aims to increase knowledge about elasmobranchs, and better conservation and education in Malta and the Mediterranean. Interactive sign painting workshops, where signs will be painted on drift wood collected from clean-ups conducted by Żibel. These signs will then be placed in various locations around Malta, encouraging people to keep Malta clean. Educational displays by both NGOs. The Gaia Foundation will be focusing on indigenous and endemic plant ecology and invasive species and will be offering an introduction to their volunteer program. Żibel will be focusing on their recent experience and findings from both terrestrial and marine clean-ups, and the current issues with micro-plastics in the Mediterranean.